:"The writing is on the wall", "a drop in the ocean" and "from strength to strength". Just some of our everyday expressions which find their roots in the Bible! People quote biblical expressions without even knowing that they are doing so. Historically, the influence of the Bible has been so great that it has permeated the very fibre of the English language. Timothy Cross in this enlightening and Scripture rooted book reveals the origins of these sayings and considers their meaning. 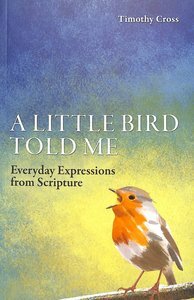 About "A Little Bird Told Me: Everyday Expressions From Scripture"